*This charming villa is located in Hacienda Las Chapas, one of the most prestigious urbanisations in the Marbella area only 25 mins from Malaga Airport. The 1500sqm plot has four bedrooms, all of which lead onto the lovely mature gardens surrounded by protected cork trees and pine trees. It has two roof terraces, one looking out to the sea, the other to an open green zone and far reaching views of the mountains. To the east is the picturesque Cabopino port whilst the Golden Sand beach is rated one of the best on the coast and is popular for the Marriott Beach resort, the 5-star Don Carlos Hotel and Nikki Beach club all within 15 mins walk or 5 mins drive. There are several golf courses in the area and the historic old town of Marbella is just 15 mins away and Puerto Banus a further 10 mins from the old town. There is an upmarket convenience store in the urbanisation and two larger supermarkets nearby. There are many beach bars and restaurants in the area to fit all budgets. We have owned our property in southern Spain for over 20 years and have used it extensively. Our 4 boys have loved spending summers there but now that they are adult we use it sightly less frequently. It is a much loved property and we hope our tenants will treat it with care as well. We both speak a bit of spanish and have connexions with the country. We love the south of Spain which has an incredible heritage. The warm weather, the friendly people and the cosmopolitan atmosphere all make life much easier here. En-suite bathroom to the master bedroom with bath/shower, WC and bidet and room heater. Family bathroom with bath/shower, WC and bidet and room heater. Cloak room with WC. All have electric sockets for dryers and shavers. There is a drive within the property where one can park a big car. The property has a gate. apart from bath and hand towels, we provide beach towels. There is a glass covered fireplace which has a built in fan that heats the room. Olive tree wood can be provided by the gardener. There is a separate indoor dining table and an two outdoor dining tables, one under a covered terrace. The lower sitting room has comfortable sofas and a Scandinavian type wood burning fire place with glass doors and a fan distributing heat. there are two tall fridge freezers to accommodate a week's groceries and drinks and more! Fully equipped & newly refit kitchen with two fridge/freezers, a dishwasher, a microwave, vitro ceramic cooker, fan and convection oven, juicer & coffee maker, with five high stools and a bar. There are sufficient pots, pans & cooking utensils. The land is 1500 sq. metres. Special features of the lawned garden are the centuries old cork trees and cup shaped pine trees that provide shade if needed and cool breeze. The gardener comes 2x a wk. There are two verandas upstairs. The bigger one has a view of the sea in the distance and has outdoor furniture for alfresco breakfast , dining or drinks. The smaller one has a view of the mountains. There is a community tennis court within a short 5 minute walking distance of the house. A key is provided to open the court gate and there is a booking sheet at the tennis court. The Rio Real, Santa Clara, Cabopino, Santa Maria, Mijas, Marbella and Santana Golf courses are all within 15 mins drive. The swimming pool is private and is shielded from the neighbours' view. It has an outdoor shower. There are eight reclining sun loungers . It is cleaned by the gardener twice a week. Notes on accommodation: The villa has just been redecorated and is fully furnished. There is air conditioning / heating in all bedrooms and floor fans are also provided. There is a wood burning fire in the lounge providing cosy warmth in the cooler months of the year. The mezzanine floor is laid to a wooden floor, has a sofa bed and a pine table with four chairs. There is a 32" wide television and DVD player with satellite connection. This room leads out to the two terraces on each side of the house. Not only do we use the terraces for sunbathing - we love watching the sunset or even viewing Morocco and Gibraltar on a very clear day. There is also a tennis court in the urbanisation which can be used free of charge. Outside: The driveway can fit 2 cars comfortably and is protected by a secure front gate. The gardens are sprawling with protected cork and pine trees providing a little welcome shade in the summer. 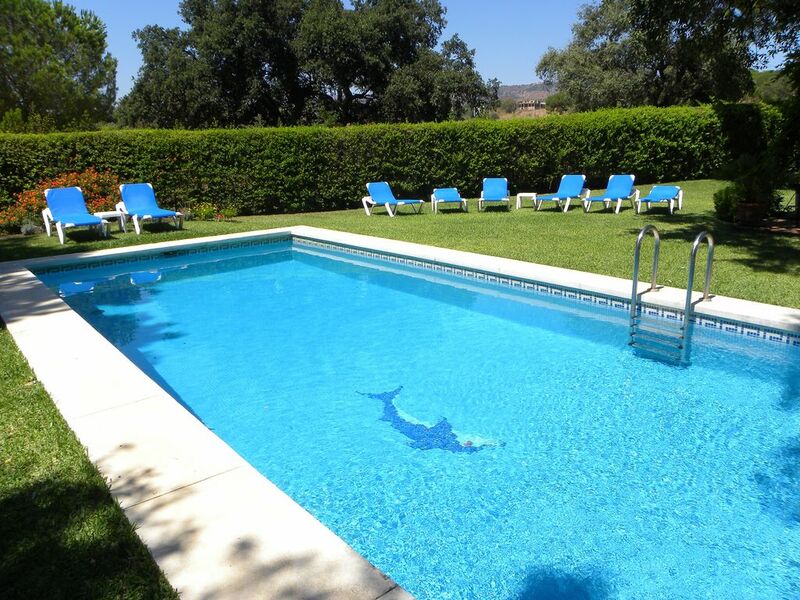 An 11m private swimming pool is located by the house and is not visible from any neighbours. There are lounge chairs for sunbathing and outdoor tables for alfresco dining either under the covered terrace or one of the beautiful trees. Utility Room: Washing machine and separate clothes dryer and cleaning equipment. Utility sink. Cleaning / Towels / Linen / Maid service: Linens and towels are changed once a week and a full cleaning service is provided at check in and check out. Additional cleaning service available at extra charge. Baby sittiing can be arranged by our management company. A pool man / gardener comes 2 week Other: The upstairs mezzanine room overlooks the living room and contains a large TV as well as a double sofa bed. This area leads to an large terrace, perfect for sunbathing which looks out to the sea and a smaller terrace which looks out to the mountains. The villa has a great location. Marbella, Fuengirola and Puoero Banus are all just a short drives away. The neigbourhood is very well kept and feels safe with security patrolling at all hours. The house itself is spacious and with a beautiful garden and pool. We travelled as a group of 21-23 yo. friends, but it would be really nice for a family vacation aswell. The communication with the owners worked great both regarding the booking and during our time in Spain. Highly recommended! AS far as we can see there was no damage in the house. My understanding is that unless we tell Home Away about a problem they will automatically refund your deposit a week after you leave, so you should get a refund shortly. Please confirm. Great, convenient location, with easy access to the main Highway; beautiful, well laid out and equipped property with very private, charming large garden, pool and terrace, making a great base for exploring the Costa del Sol and Andalucía. Thank you for your kind comments. We are glad you enjoyed your stay and hope to welcome you back before too long! Thanks for your feedback. I am glad you enjoyed your stay, especially the pool. Thank you for your positive comments and for being a very good guest. We are glad you enjoyed your holiday and would be delighted to welcome you back if you want to spend more time looking at the great cities in southern Spain. A gorgeous, spacious villa only a short walk from the beach. I had a wonderful stay last summer and would highly recommend this property. Beautifully decorated and immaculately clean with plenty of space to relax both inside and out. The garden has a good sized pool and the terrace is perfect for long summer evenings dining with friends and family. Wonderfully relaxing and a great location. We had a fabulous stay at the villa, it peaceful gardens are a treat. The location is great as it is so close the Elviria where there are excellent beaches and some of the best restaurants around. The local management company Casa Care were most helpful as well. To the east is the picturesque Cabopino port whilst the golden sand beach is rated one of the best on the coast and is popular for the Marriott Beach resort, the 5-star Don Carlos Hotel and Nikki Beach club all within 15 mins walk or 5 mins drive. There are beach bars and a wide selection of restaurants along the long coast line. Most of these places have lounge chairs and cabanas that can be hired. You can also set up your own. There are water sports facilities provided by licensed operators. Car hire is recommended although taxis are available and buses accesible. Malaga airport is 30 mins drive east (40km) whilst Gibraltar airport is 75 mins west (90km). There are regular ferries to Morroco from the port of Algeciras which is a futher 15 mins from Gibraltar. Elviria 1km west. Cabopino 1km east. Marbella 10km west (15 mins). Puerto Banus 20km west (25 mins). Coin, Estepona, Ronda, Mijas all within an hour's drive. Granada 170km (2 hours). There is an upmarket convenience store in the urbanisation and two larger supermarkets nearby, one of which sells fresh seafood everyday. there is also a butcher and an extensive delicatessen section. There are many beach bars and restaurants that cater to almost every taste - from Spanish to Italian, Indian, Chinese, Japanese etc. Solobank is in the commercial centre. There is a pharmacy as well. Our house is managed by a professional maintenance company with bilingual staff. They provide 24 hour service. We can arrange airport transfers, car hire, golf, tennis, restaurant bookings, tours, etc. Booking Notes: A non-refundable booking deposit of 25% of the total rental price secures the booking. The balance of the rental price shall be required no later than 6 weeks before commencement of the rental. A refundable security deposit will also be required either by paying 25% of the rental 6 weeks before commencement of the rental or an authority to debit any applicable deductions to a credit card with our property management company. Changeover Day: Arrival and departure times are flexible.